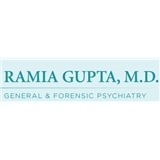 Ramia Gupta, MD. PC. (Alexandria) - Book Appointment Online! She is a thoughtful clinician and took her time. I think she is an excellent psychiatrist.